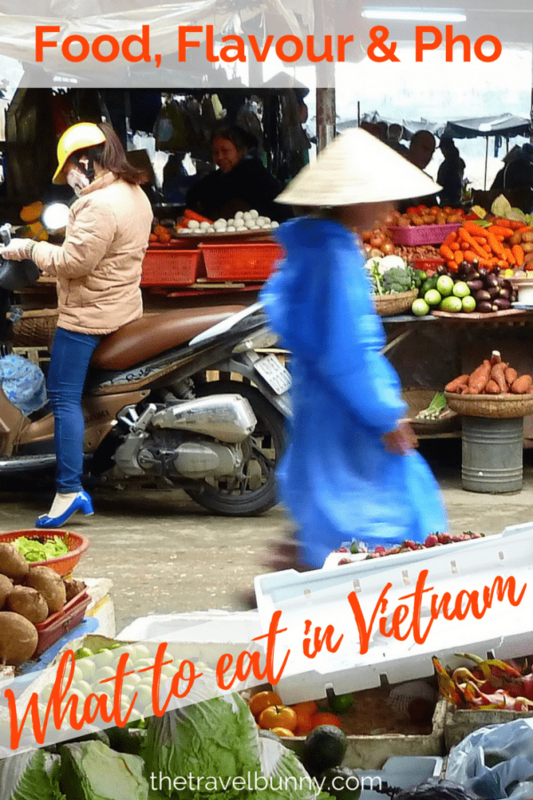 Vietnamese cuisine with its refreshing flavours, citrus hits and use of distinctive herbs and warm spices is one that’ll shake up your taste-buds. With its careful use of oil it’s also one of the healthiest. 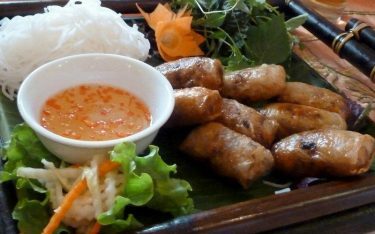 The mere thought of succulent lemon grass chicken, green papaya salad or crisp spring rolls stuffed with minced pork, ginger and Thai basil starts me salivating. Not only does it taste amazing it looks good too. The food pops with colour – think fresh green herbs, blushing-pink prawns and scarlet-red chillies against a backdrop of pale, fluffy rice. It’s simple, yet sophisticated, vibrant yet subtle. You can barely walk a block in any Vietnamese city without coming across a huddle of people sitting on little plastic chairs slurping Phở from a curb-side cooking station. 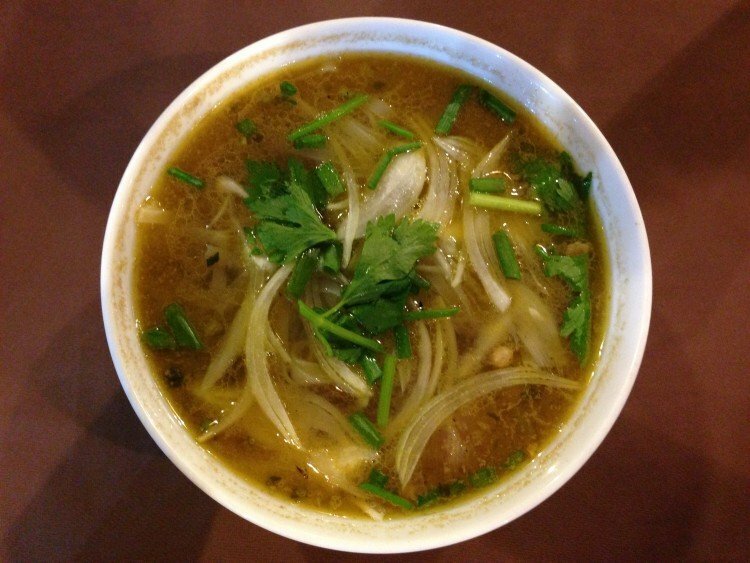 Phở is a long-simmered broth served with various meats – usually beef or chicken. 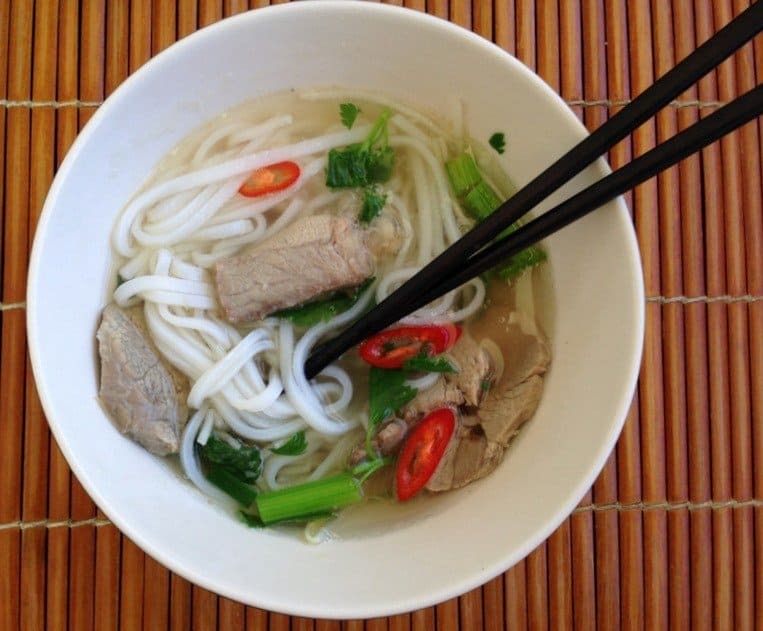 The word Phở actually refers to the rice noodles and not the soup itself. 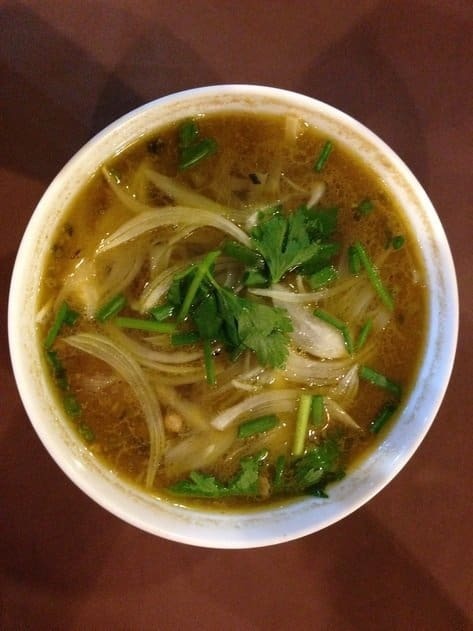 The broth contains bean sprouts and essential herbs; basil, cilantro (coriander) and spices; ginger, star anise and onions. There’s usually a dash of fish sauce and some chilli to taste. 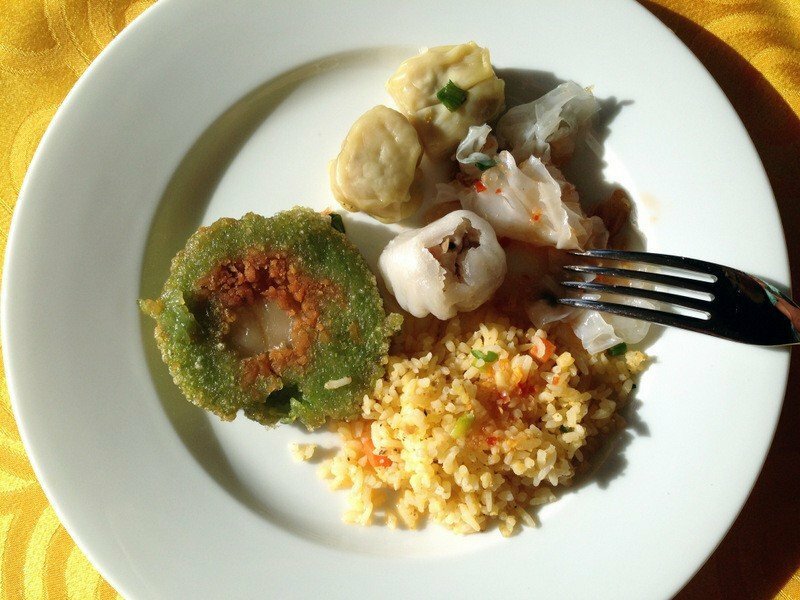 I loved this dish and by the end of our stay was even eating it for breakfast – which the Vietnamese do all the time. There’s more than one type of spring roll. Goi Cuon is the light, healthy version. 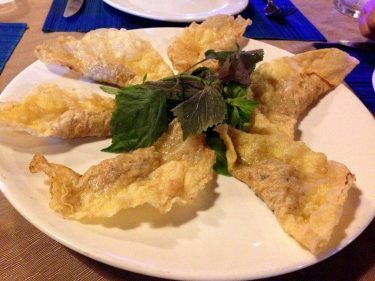 Translucent steamed rice pancakes are packed with salad greens, shrimp or pork and herbs, before being neatly rolled and dunked in chilli dipping sauce or fish sauce. 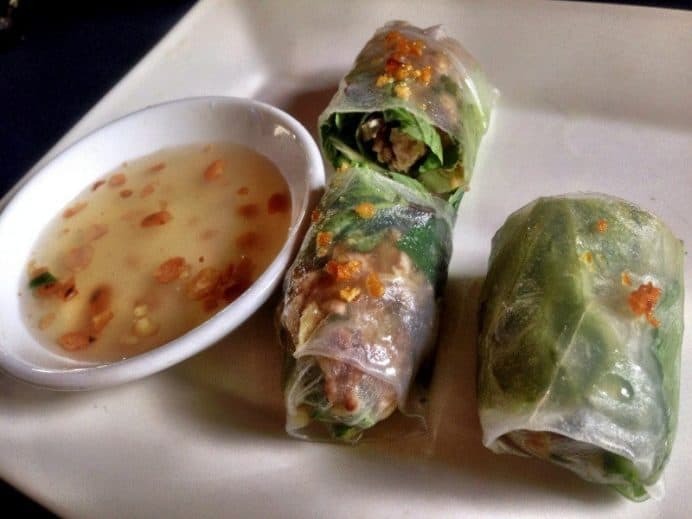 Then there’s the crisp, deep-fried, steaming hot spring rolls filled with minced pork, or shrimp, bean sprouts and vegetables and served with sweet chilli sauce, fish sauce or peanut sauce. Both are good and make a good starter or lunchtime snack. Bánh tét or sticky rice cakes are traditionally eaten at Tet, the Vietnamese Lunar New Year. The beautifully chewy cakes, made with glutinous rice, can be stuffed with pork and/or mung bean paste and are delicious. They’re cooked wrapped in banana leaves, which gives them their greenish colour, and steamed for hours. I had these for breakfast a couple of times and it was the first time I’d tried them. Delicious. 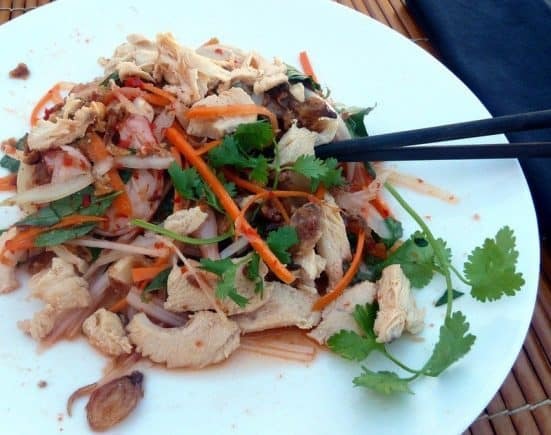 If I had to choose a favourite Vietnamese dish this would be it – the chicken version made with the holy trinity of Asian spices; lemongrass, chilli and garlic. This slightly sweet, stir-fried dish with intense lemon grass notes and a pop of chilli is deliciously simple served with jasmine rice and a squeeze of lime. I had this at least three times while we were in Vietnam and am going to make it at home too. Just love it! Goi is a generic term for “salad” in Vietnam and its my absolute favourite form of salad. 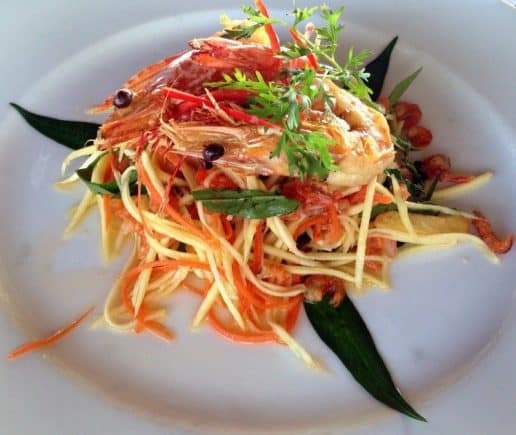 Crisp green Papaya or green mango with carrot is thinly sliced or grated, onion is added and it’s mixed and dressed with nước chấm (fish sauce), a handful of fragrant Asian herbs and topped with crushed peanuts and a wedge of lime. 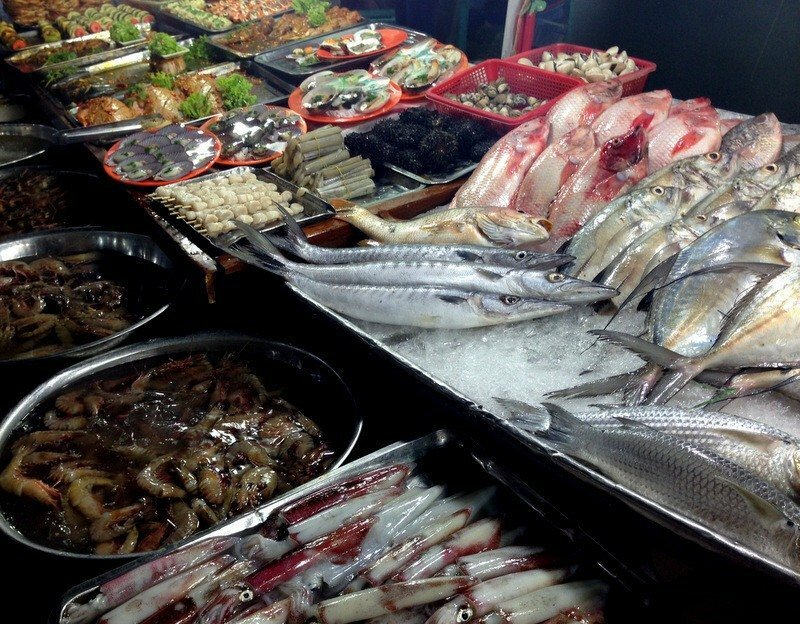 Shrimps, prawns or chicken can be added for a more substantial meal. This dish is bursting with flavour, crunchy texture and was one of my favourite lunch dishes. 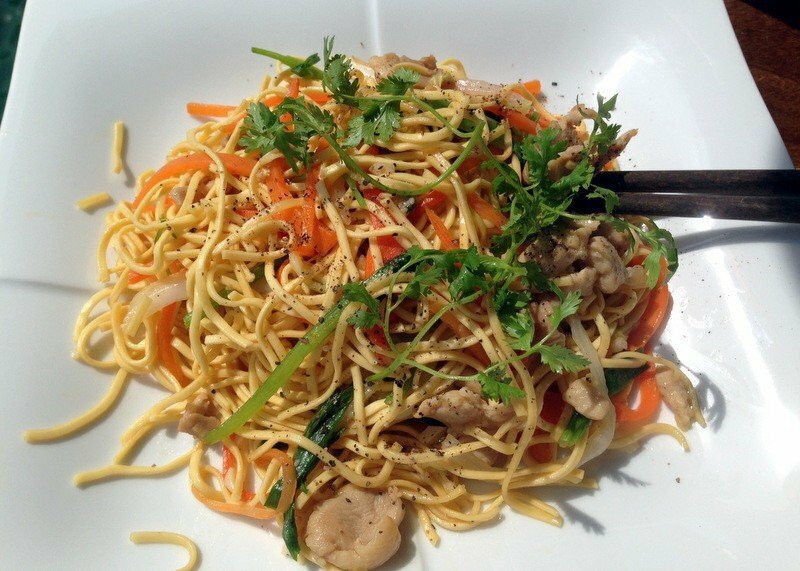 Noodles figure heavily and there are many types; wheat-flour, tapioca flour noodles or many types of rice noodles which are a translucent white and gluten-free. Noodles are used in many dishes, cold in salads or hot in a stir-fry or bowl of Phở. They make a nice change from rice. 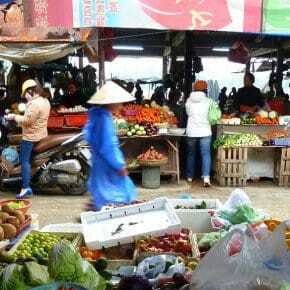 The south of the country is Vietnam’s exotic fruit basket and we found fruit stalls dotted all along the main street in Mui Ne. 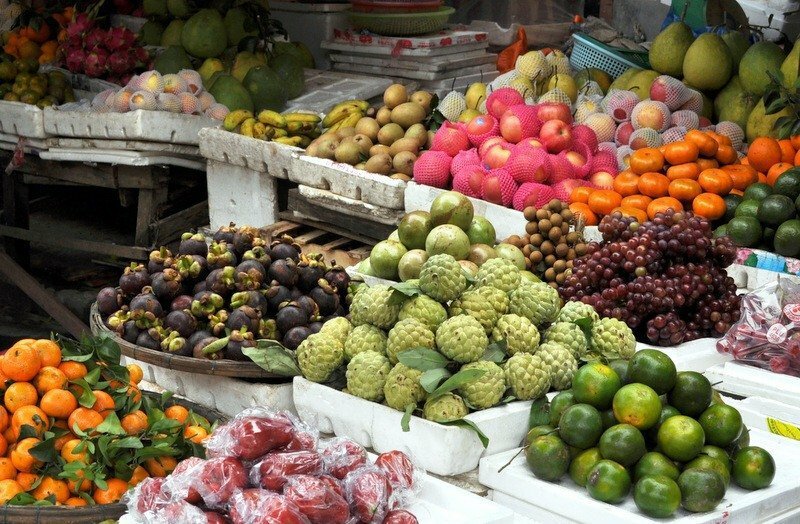 These colourful stalls were piled high with countless varieties of eye-catching brightly coloured fruit. Bright pink Dragon Fruit were everywhere and we’d passed fields of them as we arrived on our journey as they are farmed locally. Inside the flesh is very white and dotted with tiny black seeds. They have a similar texture to watermelon but are not quite as sweet. Yellow mangos are sweet, succulent and juicy and found in deserts and juice drinks. Green mangos, which are not so sweet, are shredded and used in salads. Rambutans look like mini sea-urchins and once you peel the skin off, which isn’t sharp, you’ll find a translucent white, incredibly sweet fruit. The spiked coated Durian has a reputation which precedes it due to its smell. They stink. It’s so bad that there are signs in taxis, airports and hotels banning them. If you can get past the stink the inner, yellow, fruit is supposed to be delicious. ‘Smell like hell, taste like heaven’. I didn’t go there! 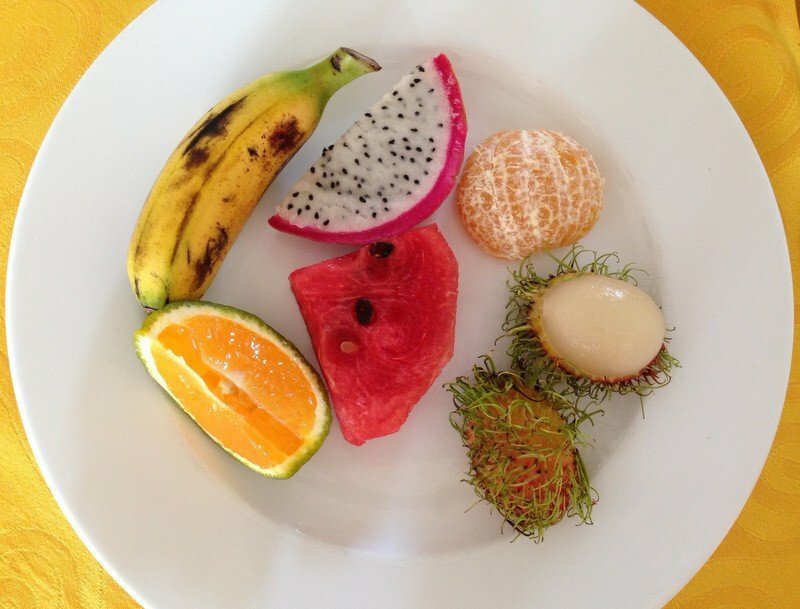 This is just a taster but I could write a whole post on the fruits we ate in Vietnam. 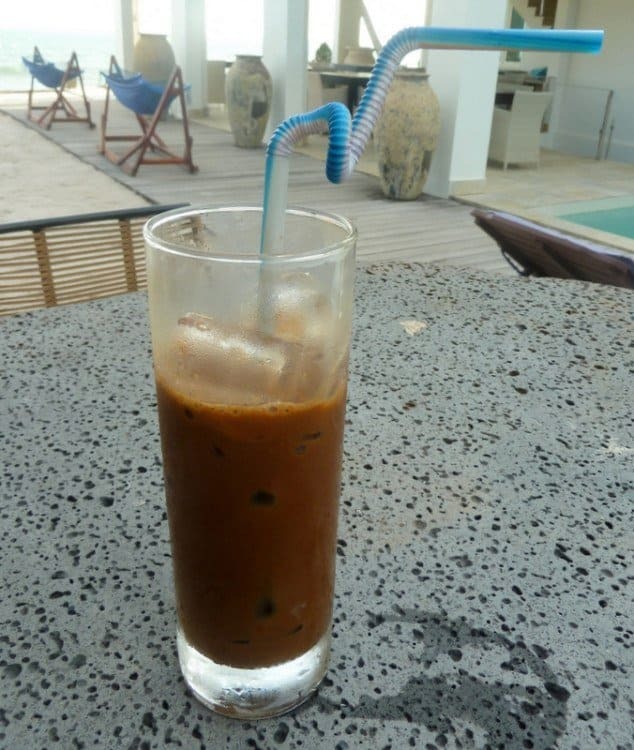 Coffee has been an integral part of modern Vietnamese society since it was introduced by the French in the 1800s. In fact it’s a national obsession and is drunk morning, noon and night. Vietnam produces huge amounts of the Robusta coffee bean with its slightly bitter, chocolatey taste, lower acidity and more caffeine than the Arabica bean. Iced coffee (ca phe sua da), is often drunk and is brewed over a single metal drip filter called a ‘ca phe phin’. Condensed milk is poured into a glass to tone down the bitterness, the glass is topped up with ice cubes and the coffee poured through the ice – it’s delicious and the perfect drink to perk you up on a hot and hazy Hanoi afternoon. In fact it’s so sweet it could be considered a dessert with all that sticky sweet condensed milk. 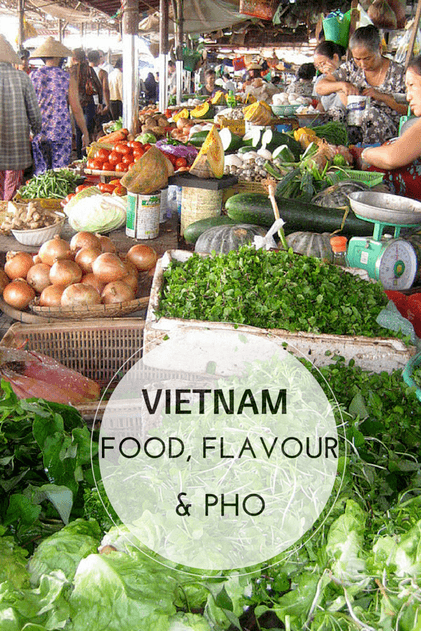 Vietnamese is one of my favourite cuisines and hopefully you can see why from the dishes I’ve shared above. Do you have a favourite? 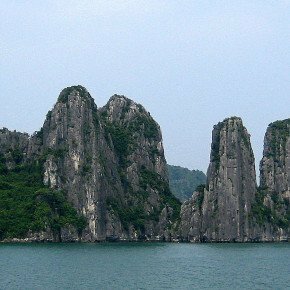 I tried most of these on honeymoon in Hanoi. Loved pho but my favourite was crab and spring rolls! Did you try crab in tamarind? – that’s just divine! great post! 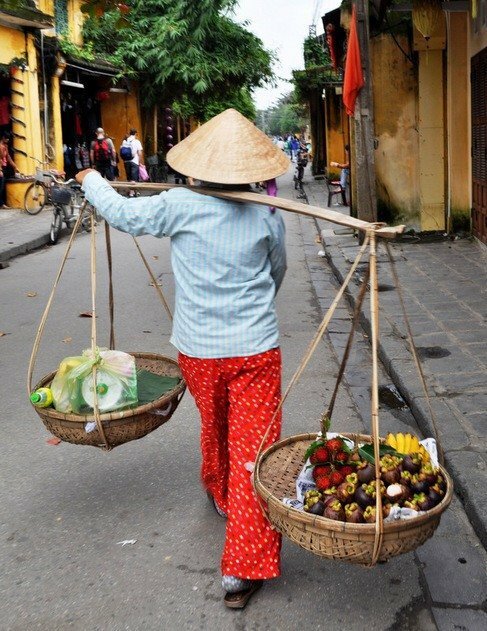 I love Vietnamese food and crave for it all the time. I’m now following your blog and I hope we can share more travel stories with each other! 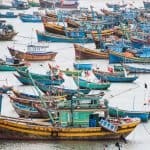 Something for everyone in Vietnam! I didn’t try much in the way of deserts – we stuck to the fruit as it was so delish! Well, it IS breakfast time, Suze, but I was thinking more pink grapefruit and toast 🙂 Boring, huh? I’ve never tasted much Vietnamese food but this looks absolutely delicious! Where to start. I think I’d better take a trip over there to get the authentic experience 🙂 Speaking of which, where are you off to for your birthday this month? 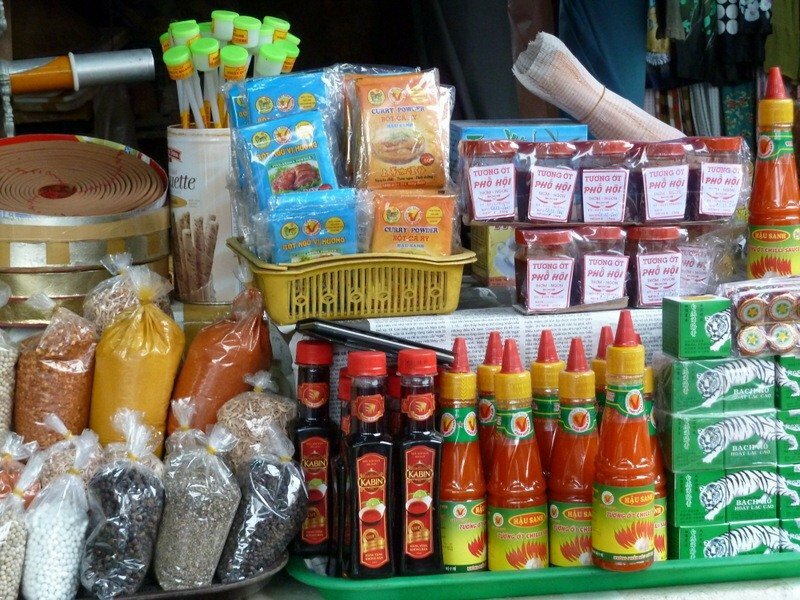 Your post is great and the picture of the mobile vendor just brilliant. She seems to be in a hurry to get somewhere. Did you shoot her from the front too? No Wilbur I didn’t shoot her from the front – couldn’t catch up with her…! Mmm, I love spring rolls and the fruit looks fantastic. What a culinary adventure!